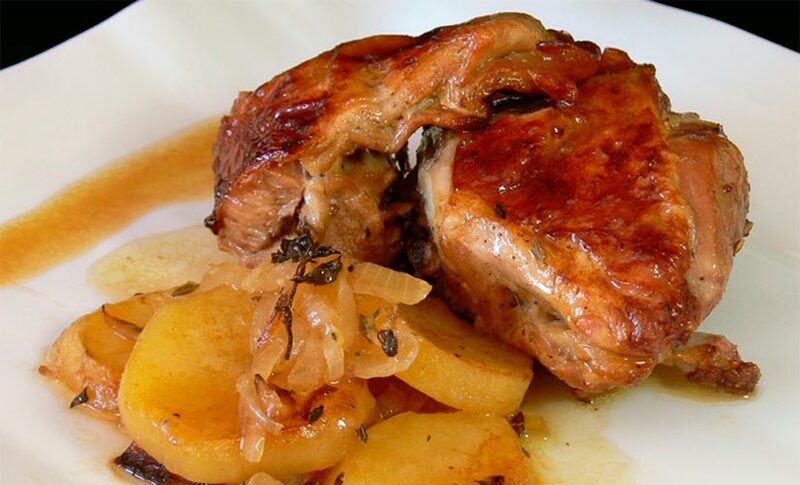 The recipe of roast ternasco with potatoes (young lamb) is quite typical in Aragon. In fact, ternasco has a Protected Geographical Indication: the young lambs must be slaughtered before they are 90 days old, and their weight must range between 8 and 12.5 kilograms. Learn how to cook this traditional recipe that will delight your family and friends. Peel the potatoes and cut into slices. Then, place them in an oven dish as a bed for the roast. Add salt. Now add the sweet onion on top of the potatoes. Mix the garlic, parsley and oil. Put aside. Put the ternasco pieces on top of the potatoes and onion. Preheat the oven to 180 Celsius degrees. Now dress the ternasco with the mixture of oil, garlic and parsley. Pour some water on the ternasco. Put the dish on the oven for 20 minutes (180 Celcius degrees). When you see that the ternasco has been cooked, turn it so that the other side can be cooked as well. Pour some water every 15-20 minutes, bearing in mind that in the last half an hour of cooking the water must evaporate. Depending on the oven and temperature, it might take between 2 and 3 hours to cook. The more time the dish is cooked in the oven, the more tender the meat will be -although the temperature must be low. The wine is poured the last time we garnish the ternasco with water.